A hospital admission is a disconcerting experience for people of all ages – for children it can be a confusing and frightening time. Over 500,000 children under the age of 14 are admitted to hospital each year in Australia for various reasons. Unfortunately, some of those reasons require extended stays or repeat visits. Capes 4 Kids Australia Inc. is the first program of its kind in Australia. The program arranges, makes and gifts super powered capes to young people in hospital. The handcrafted capes help children undergoing treatments and procedures to embrace their inner superhero allowing them to find their strength and fight some of the unique challenges they face on a daily basis. 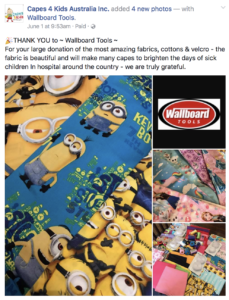 Wallboard Tools is proud to be able to support such a special and unique initiative. Can you help bring a smile to a young crusaders face? Find out how you can help on the website Capes 4 Kids Australia Inc., or connect with the organisation via their Facebook page.